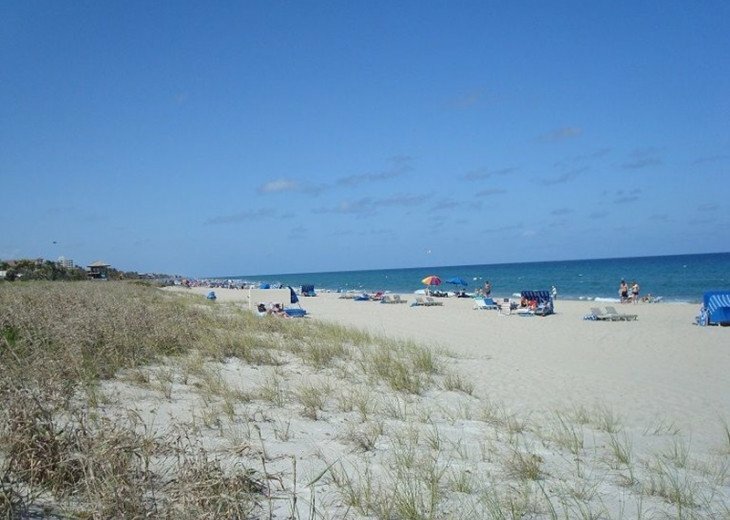 Delray Beach, a popular vacation destination with a world-class beach and water sports, is located in Southeast Florida ’s Gold Coast, on the Intracoastal Waterway ICW, conveniently situated between 2 international airports, Palm Beach International Airport-PBI and Fort Lauderdale/Hollywood International Airport-FLL and 45 minutes to Miami International MIA. 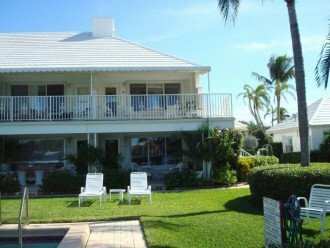 If you are looking for a 2/2 see our Golf Villa or a longer term rental at PGA National in Palm Beach Gardens a gated resort with two pools, full amenities and possibility of transferring our full golf PGA Country Club, CC, membership for two. 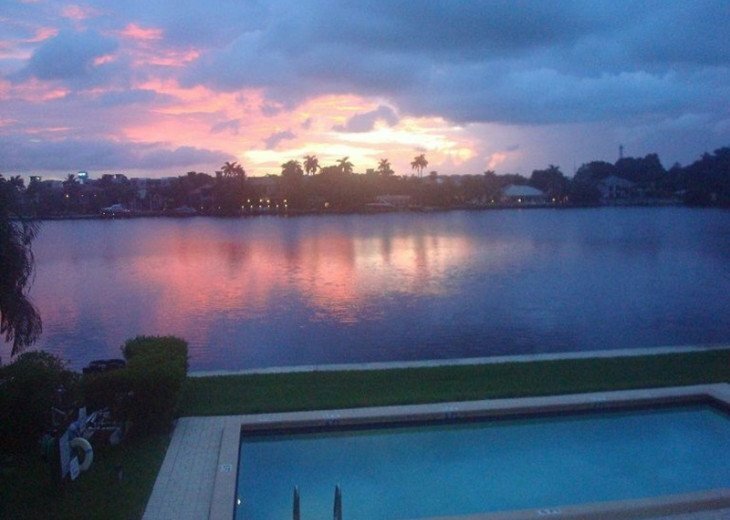 Relax in popular Delray Beach, only 24 miles south of Palm Beach with urbane Miami and Ft Lauderdale to the south. With its colorful sky blue cabanas this idyllic tropical getaway is a slice of where the Cote D'Azure meets Old Florida. 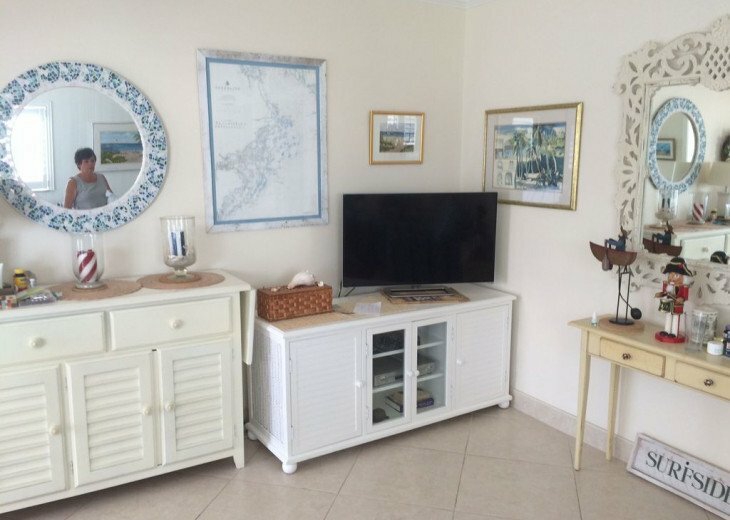 This prime location of the waterfront modern condo is a 4 minute promenade to a clean wide sparkling blue Atlantic Ocean sandy beach and 10 minute walk to Atlantic Avenue, a fun-loving village with two miles of white sand clean beach. We provide beach towels and beach chairs. 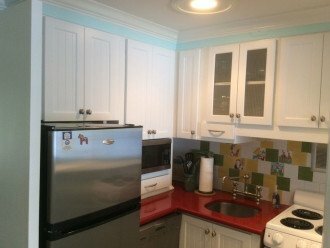 The waterfront condo is on the exclusive and appealing ocean side of wide ribbon of the Intracoastal Waterway, part of a barrier island in the historic beach area, awarded a Certified Blue Wave Beach by the Clean Beaches Council with its mandate to protect the natural environment. 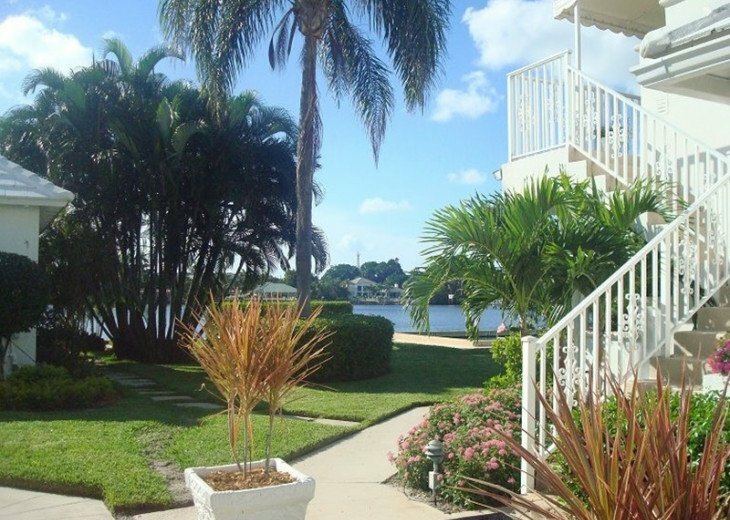 Enjoy dining on the balcony with one of the best water views in SE Florida. 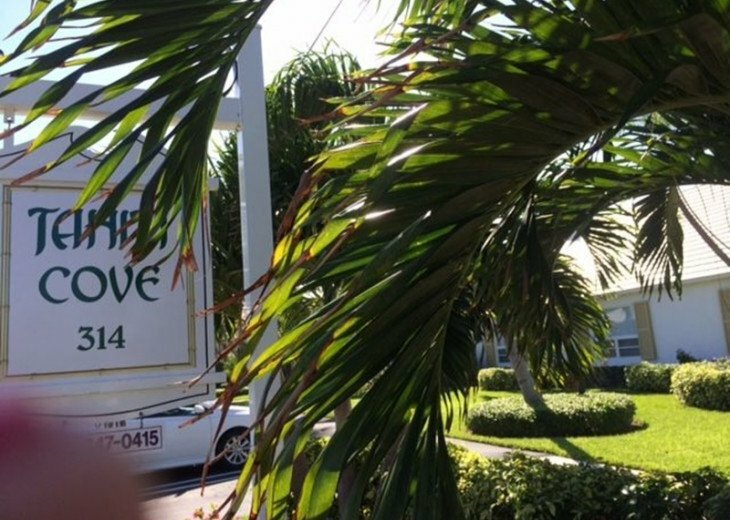 Ideally located in the village only 2.5 blocks to the vibe of popular Atlantic Avenue,the main thoroughfare of Delray Beach, lined with small locally owned boutiques and cafes. 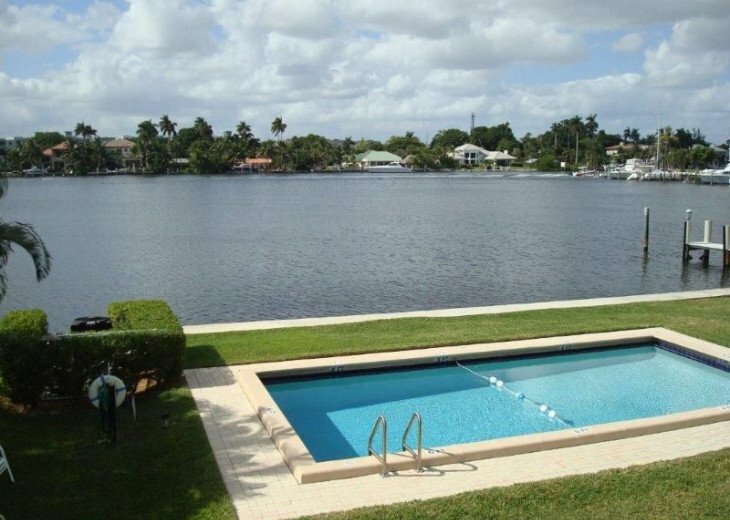 See how good life can be in this charming and enticing South East Florida seaside village with amenities and services linked to the greater Palm Beach & Boca Raton metropolitan areas. Experience outstanding Delray Beach-described in the NYTimes as a South Florida destination with 'Style Without Attitude' full of energy and creativity. Delray Beach is a current winner in the America's Happiest Seaside Towns 2015-a fourth annual competition as part of the list of the top places to live and visit on the US coast. 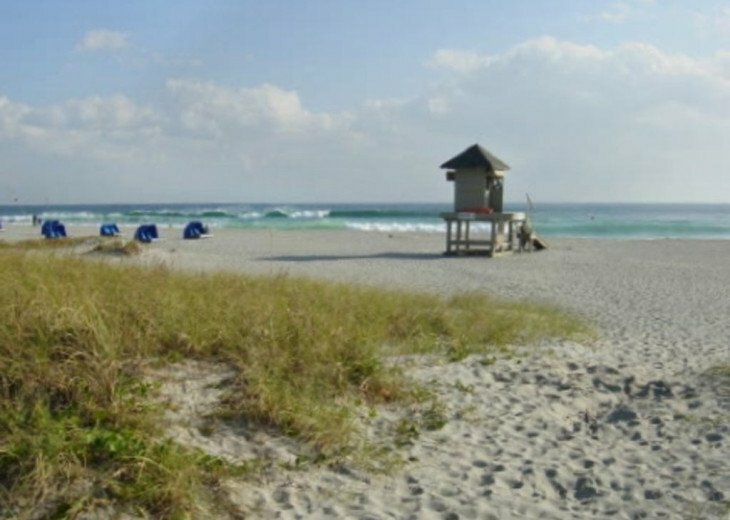 Delray beach is more than just a “Village by the Sea”, it’s also rated the number one beach in Florida in Viewer's Choice as well as the “Most Fun Small Town in America”, according to Rand McNally. The experienced owner discusses all aspects prior to booking with all guests via telephone and e mail-you are most welcome to call & please include guest telephone number. Please note-Max number of guests two. Not suitable for children. 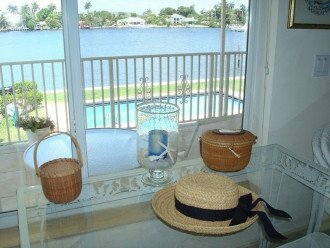 Normally we rent month high season-winter-rates based on weekly a weekly rate by tradition, and the waterfront condo is all about 'location' and view with a tropical natural setting which is a plus for a special vacation rental. Delray Beach is an ocean front community founded in 1895 with New England seaside Main Street charm. 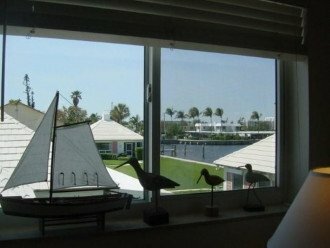 Enjoy a calm holiday in a unique smoke/pet free property on the quiet barrier island on the east (ocean side) of the Intracoastal Waterway, (ICW), a short stroll to the Atlantic Ocean. 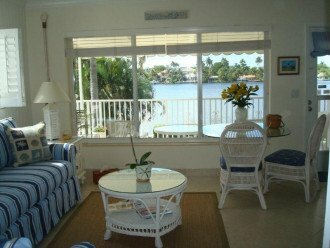 This special modern condo, with central air and an ultra violet light to cleanse the air, enjoys a prime location in a small lush 18 unit complex which offers reserved parking and a stunning direct waterfront view from balcony (an end unit on top or second floor), located in the Nassau Park Historic District, the first locally designated historic district in Delray Beach. 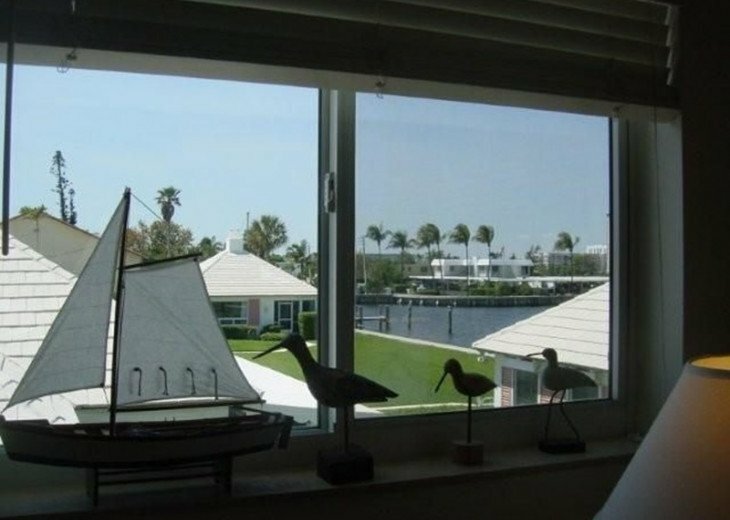 From the vantage point of your waterfront balcony watch the boats glide past across a wide expanse of the Intracoastal Waterway and the calm of a no-wake zone. 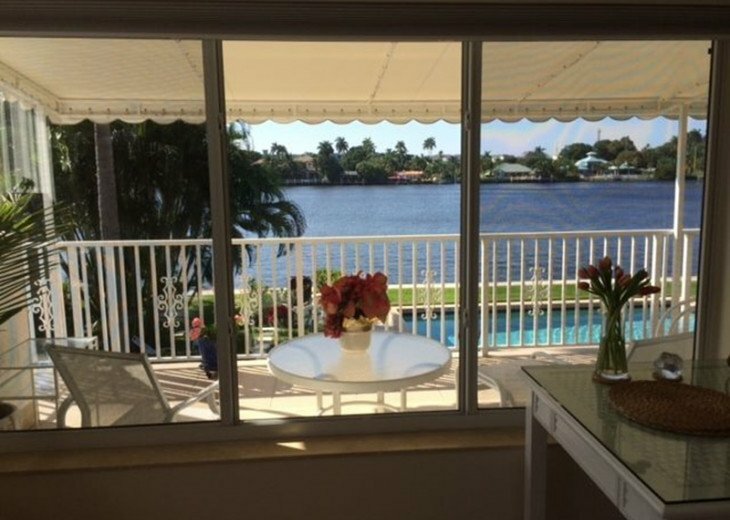 Choose from a myriad of healthy, fun, outdoor activities in the vibrant seaside village of Delray Beach on the Atlantic Ocean, in S. Palm Beach County, 20 min to PBI airport, within an hour of FLL & Miami airports, and two hours to the Florida Keys. 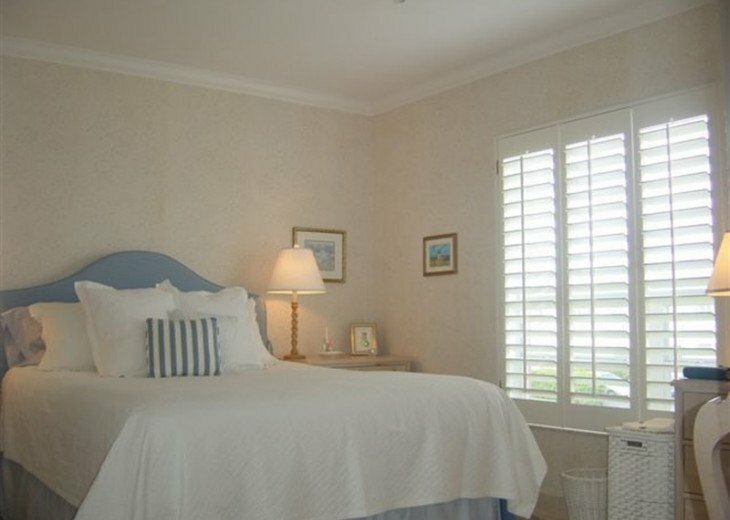 Enjoy walking to all nearby attractions and well known restaurants such as the new Boston's Ocean 50 upstairs with an ocean view and the adjacent Sand Bar, or Salt or many others with great happy hours as well, and stay at a prime address with a short walk to the clean and wide Atlantic beach. The charming end unit condo is not only fully furnished but modernized and attractively appointed & offers; central A/C & heat with an ultra violet light to cleanse the air, new stainless steel Miele dishwasher & new SS fridge, Franke stainless sink & faucet, Quartz kitchen & Corian BR vanity counter tops, just new electric range and oven, new stainless micro, porcelain Italian tile floors, wonderful balcony for reading and al fresco dining with water view, tiled WC & shower with glass doors, custom plantation shutters, and new Samsung flat screen TV, free cable TV and WiFi-all well decorated in the mode of an international mix of an eclectic St.Tropez/Nantucket/Swedish/Floridian beach cottage. We include mid term housekeeping for monthly stays for your relaxation and fresh environment. 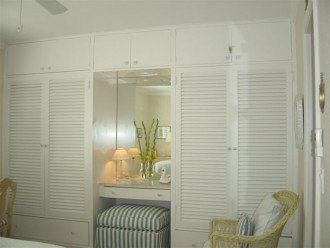 We also supply beach chairs and keep beach towels on hand for your convenience. 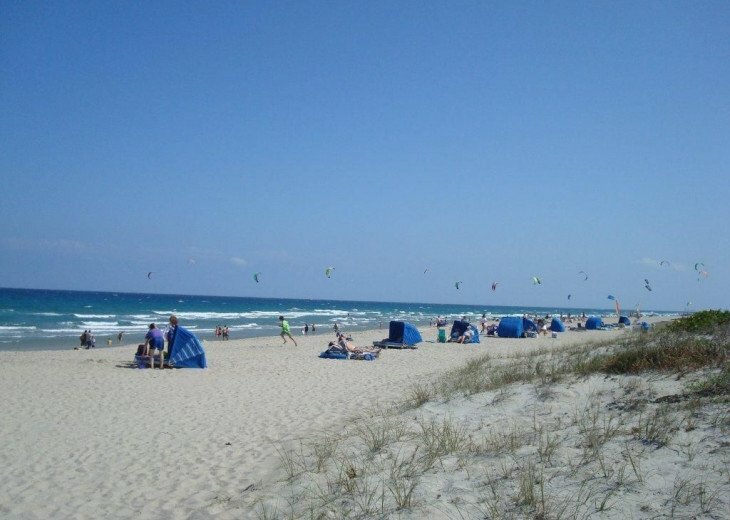 The periodical, Coastal Living, described Delray Beach as an international destination with a European flavor, highlighting two miles of wide beaches with sea oats and sand dunes. 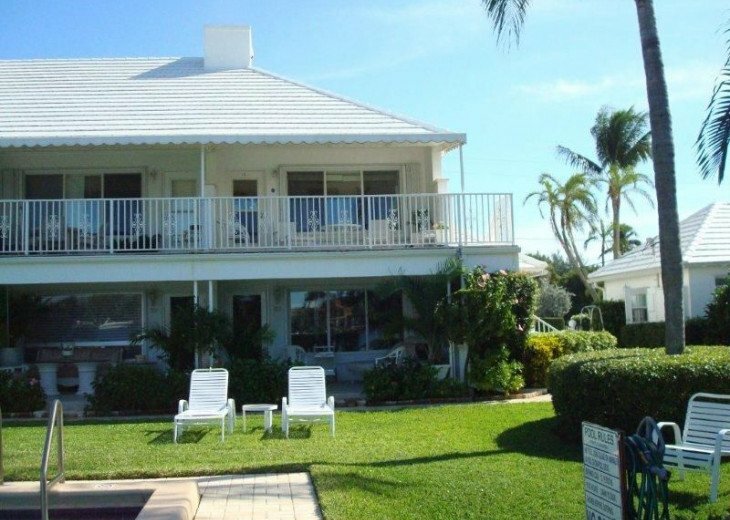 Enjoy a pleasant stroll to popular Atlantic Avenue and a variety of cafes, pubs, art galleries, and boutiques, and nearby access to numerous golf courses-Donald Ross designed municipal Delray Golf Club, Delray Tennis Center, boating, paddle boarding, and Florida warm-weather activities. 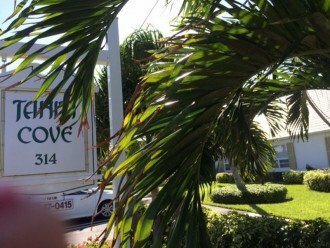 A popular destination-Delray Beach is a renowned seaside village with a serene, carefree, healthy and relaxing atmosphere for all ages. 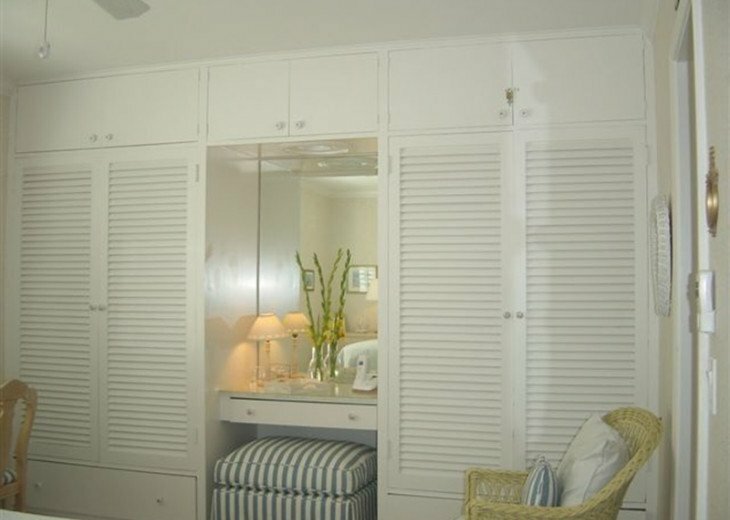 Sunbathe and daydream at the beach or at our heated pool on the waterway, read a book, walk or jog by the ocean, all in a secure seaside neighborhood-an abundance of sun & pleasant experiences and memories in a relaxing milieu with balmy breezes. 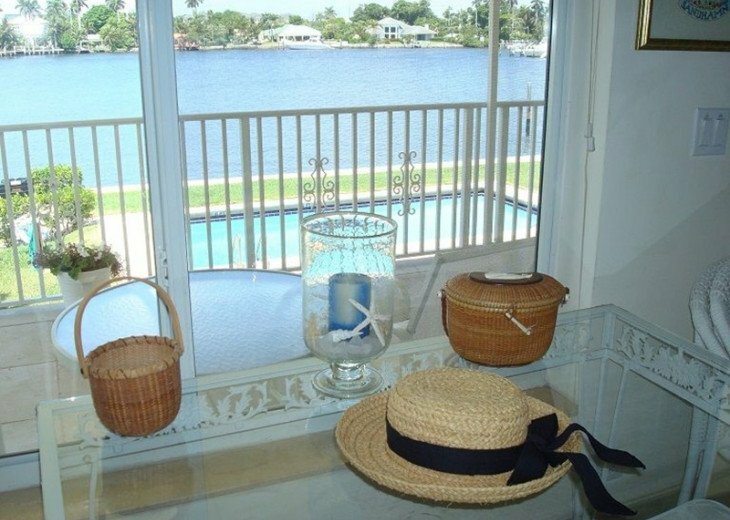 The modern, 'beach cottage' corner condo with side staircase going to the second floor unit in 'Olde Delray' has an outstanding and expansive water view in a enticing natural setting. Enjoy outstanding sunsets from your quiet balcony, ideal for al fresco dining, and a small complex embracing a high standard for your enjoyment in the historic beach area in an award-winning Village-by-the Sea. History plays a big role in the identity of the seaside community located between Palm Beach & Boca Raton. Delray and is a leader in Florida’s historic preservation movement, designating several neighborhoods as historic districts to preserve its illustrious past. Downtown Delray Beach features the boutique-and café lined Atlantic Avenue is the Old School Square Cultural Arts Center, which has been a transformed into the centerpiece of this historic downtown shopping district. There are also museums, theaters as well as an outdoor entertainment pavilion. 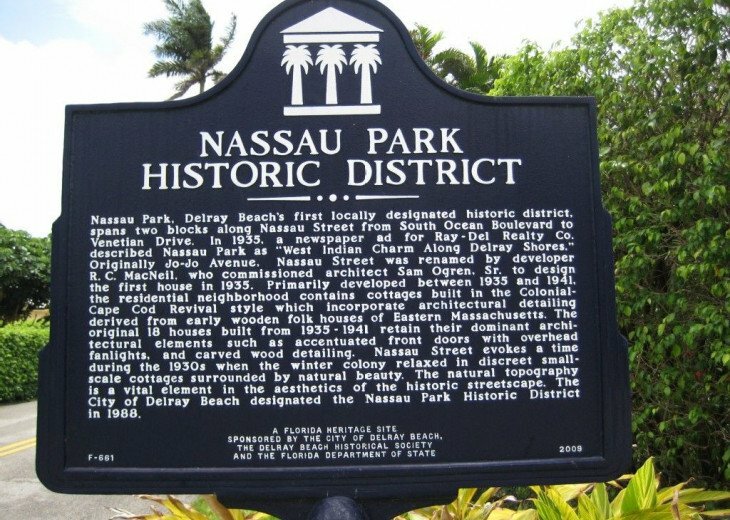 Delray Beach is on the National Register of Historic Places and its center is adjacent to Old School Square. Pineapple Grove is an area vibrant with art galleries and sculptures by local artists. The Cornell Museum, the Crest Theatre, the Morikami Museum and Japanese Gardens, the American Orchid Society’s world headquarters, the Palm Beach Photographic Center, Cason Cottage Museum and the Delray Beach Playhouse round out the town’s many cultural offerings. In addition to an historic past and preservation, enjoy the condo's beautiful natural setting in a charming Village by the Sea-dive in! 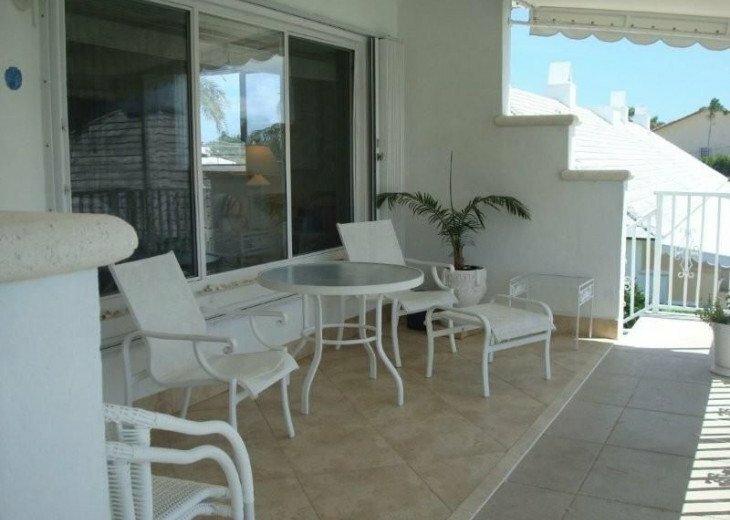 The private porch with the expanded view of Intracoastal and the walk to the beach and the little longer walk to the restaurants at Atlantic Av makes it a wonderful vacation home. 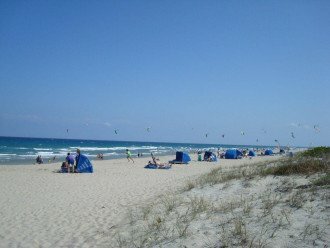 Beach and Delray Beach center with Atlantic Av. Less than five minute walk to the Atlantic Ocean Beach. 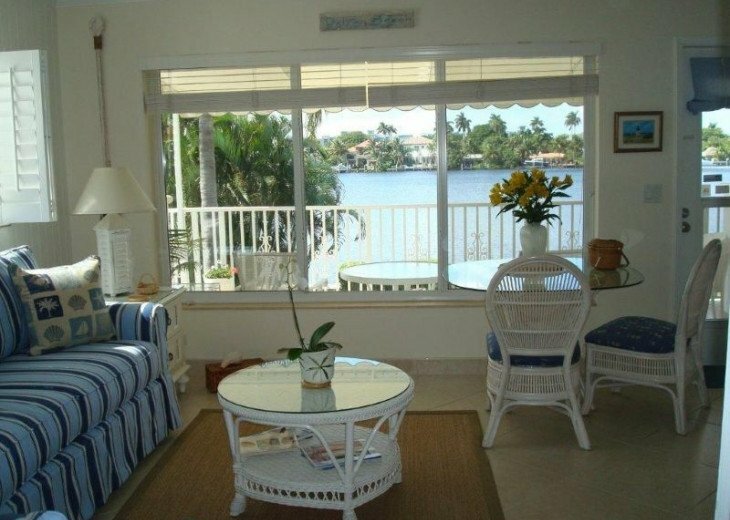 End unit condo with-great view of the intracoastal, heated pool. Central air, heated pool, waterfront, al fresco dining, ice machine on property-small quiet and exclusive complex of 18 units/gated-popular and unique historic Sea Gate & Nassau Park beach area in seaside village of Delray Beach. What a special vacation rental! 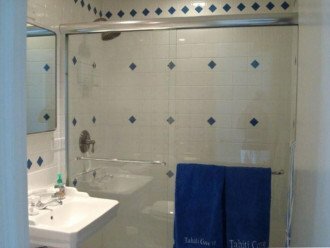 In the perfect location, this condo has everything that you need to make your stay comfortable and enjoyable. It is immaculate. Watching the sunrise and sunset from the balcony is a gift. Thank you Elaine and Dan for everything. Tahiti Cove was a perfect choice for my winter break. 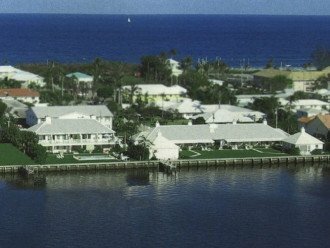 I spent a month in this lovely waterfront property. 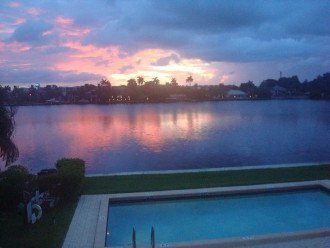 The view from the second floor terrace overlooking the Intercoastal was beautiful and the sunsets spectacular. It was fun to watch the boats go by and just a short walk to Atlantic Avenue for restaurants, cafes and shops. There are so many great places for Happy Hour. The upscale neighborhood was quiet with many lovely gardens and homes to see on the very short walk to the beach. Thank you Elaine and Dan for being so helpful. I look forward to returning next year. My husband and I are very well traveled and visit Delray Beach several times a year because our friends live there. We stayed here for one week (in May 2011), and this was our first time staying at a property that we found on VRBO. After weeks of research and talking on the phone with Elaine a couple of times, we decided to rent her condo at Tahiti Cove, and I'm so glad we did! 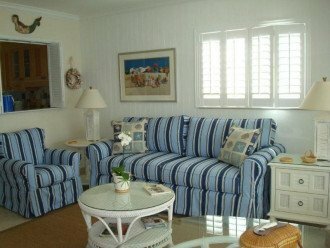 I must tell you that Elaine was a pleasure to deal with and she takes great pride in seeing that everything in her Condo is well kept and that you have everything you need for a wonderful vacation! 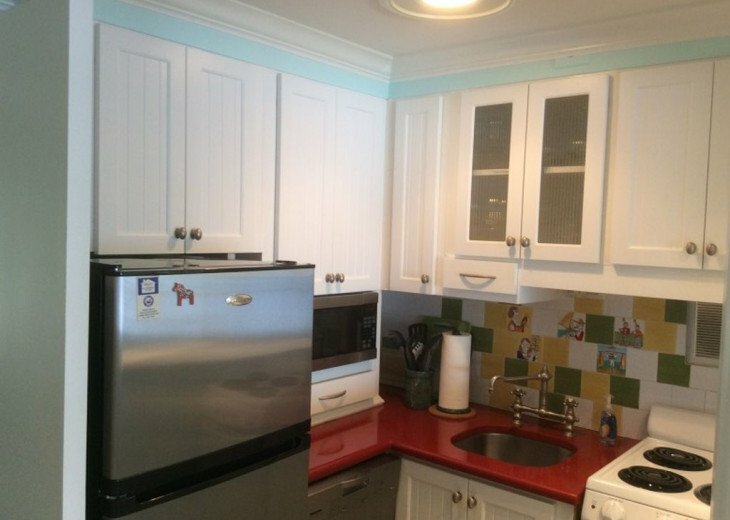 The location of this Condo cannot be beat! 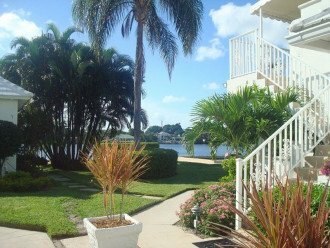 It is on the second floor (end unit) of a two-story building, and it has its own private staircase leading up to the patio which overlooks the pool and the Intercoastal. We loved sitting outside every morning eating our breakfast and in the afternoons it was nice to sit out there and have a cocktail before dinner and watch the boats go by... And the sunsets - I just have one word...AMAZING!!! The beach was only a quick 5 minute walk away and world famous Atlantic Avenue with every type of bar and restaurant you can imagine, as well as lots of little shops, was only about a 10 minute walk. While strolling down Atlantic Ave., be sure and visit Cupcake Couture Sweet Boutique (my favorite cupcakes in the world) - and try the Jimmy Choo Chocolate Cupcakes - I promise you'll love their cupcakes!!! 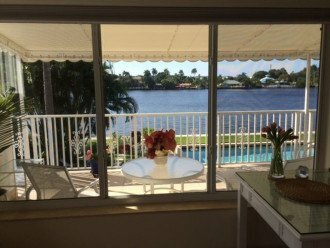 The Condo is also about a half hour from West Palm Beach Airport (PBI) and about 45 mins to an hour (depending on traffic) from Fort Lauderdale Airport (FLL). 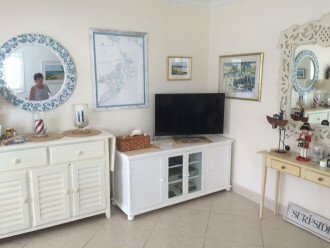 If you are looking for a great place to stay in Delray Beach that is clean, well-cared for, nicely furnished and close to everything, then look no further...this is it!...We are already making plans to go back next year and would highly recommend this condo to all of our friends and family. Wonderful week but too short ! 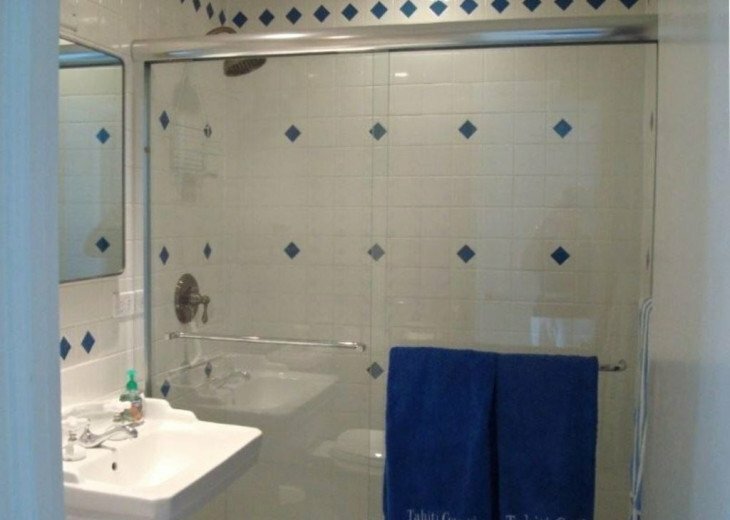 Everything was perfect, very clean and bright. Very quiet. The amenities are great and the owner is very kind. 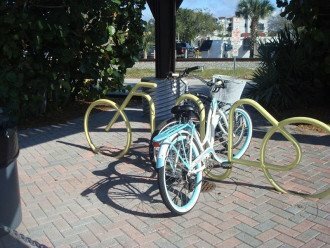 Delray Beach is a charming town with a lot of great restaurants. My husband and I enjoyed our stay there very much. 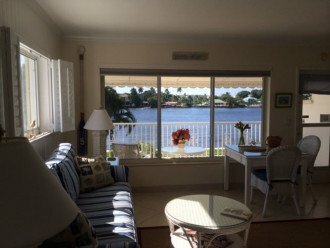 I spent a wonderful month in this small but nice condo with views of the intercostal and a 10 minute walk to Atlantic Ave. 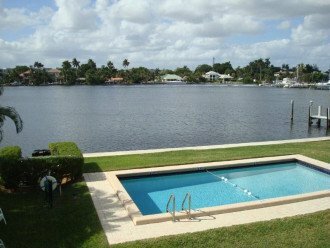 It is a gated complex with a very nice pool surrounded by a thick grass lawn.